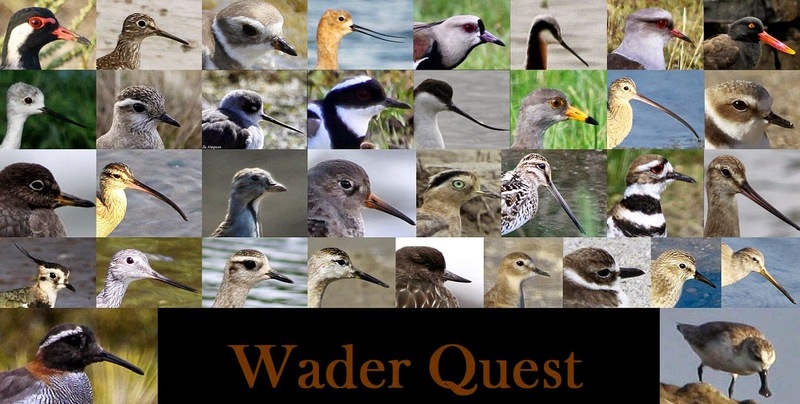 Wader Quest: Wader Quest role of honour! Wader Quest role of honour! The JustGiving link for donations for the Spoon-billed Sandpiper captive breeding programme closed yesterday, the final result was a satisfying £3,260.56. To this will be added a certain amount from gift aid contributions and the total should reach £3,300.00. Our target was £3,000 so we are very pleased. But this was not all down to us of course, a great number of people were involved in many ways making the whole travelling extravaganza what it was, attracting so many generous donations. To each and every one we offer you our sincerest thanks. A big THANK YOU to everyone who donated, advised, guided, provided accommodation and/or transport or otherwise helped us along the way..
George and Barbara Simpson, David and Claire Simpson, Martin Simpson. Alan Davies and Ruth Miller (The Biggest Twitch), Marc Hughes, Alan McBride, Gary Waddington, Jason Williams, Sacha Barbato (Trailfinders), Duncan Macdonald (Wildsounds), David Lindo (The Urban Birder), Kieth Betton (African Bird Club). WWT Slimbridge: Dr. Debbie Pain, Martin McGill, Nigel Jarret, Nicky Hiscock, Tanya Grigg, Ellie Wise Hannah Clifford (Martin Mere). Peter Ericsson (Thai Birder), Nick Upton (Thai Birding), Mark Andrews. Tommy and Maja Pedersen, Colin Simpson. Rangel Diaz, Jim King, Daphne Rodriguez, Robin Diaz, Charlotte Miller. Garry George, Gary and Lesley Nunn, Paul Lehman, Guy McCaskie, David Seay. Judith O’Neale, Joelle Finlay, Ken Harris, Cyndi Sellers, Steve Cardiff, Donna Dottman, Danny and Rob Dobbs, Kevin and Shirley Berken. Renzo and Ivonne Zeppilli, Augusto Lescano, Paula Quiroz. Peter Jenny and Megan Sharland, Sue, Owen and Kim Oertli, Chris Spengler, Trevor and Margaret Hardaker, Adam Riley (Rockjumper Tours) Riëtte and Jan Griesel (garingboom Guest Farm), Dup du Plessis and his sister Ansie, Salvation, Shah and Kirstin (Pangolin Safaris). Paul Dodd and Ruth Woodrow, Martin Cachard, Adrian Boyle, Chris Hassell, Grace Maglio, Grainne Maguire and Renée Mead (BirdLife Australia), J Giles, Mandy Soymanoff (Broome Bird Observatory). Brent Stephenson and Sav Saville (Wrybill Birding Tours), Phil Battley, Craig Steed and family, John and Elaine Dowding, Antje Leseberg,.Craig Steed and family. Martha Argel and Umberto Moura-Neto, Roséli Nascimento, Gislaine Disconzi, Guto Carvalho, Rafael Dias, João Batista, Suzi Paiva, Andy and Catarina Simpson. Ram Pratap Singh, Manoj Vardhan (iGT), Harsh Vardhan, Satya, Rashpal, Anil, Musheer. Jayne Watts, Annette Cunniffe, Sue Hyde, Chorleywood RSPB group, Alan Bedford, Ben Tarvie, Mikko S, Juha, DJ Lindo, Antti R, Peter Sharland, Arja G, Nina Nuora, Riitta and Alpo Parkkonen, T Grigg, Juha Saikkonen, Peter Sharland, Julian Wyllie, Michael Davis, Mr. Etienne Marais, Mum and Dad, Waderquest SA - Peter Sharland, Dennis & Amanda Walden, Mr. Dewald Swanepoel, Rick Simpson - Wader Quest, Nick Truby, John and Joan Hardy of Newport Pagnell, Worcs and Malvern RSPB local group, Mr. Andre Marx, Pesic Pedersen's in Dubai, matt, M Prince, Chris Hughes, Celia Huma, A ZAR 400-00 pledge to Waderquest for Wader watch Wider Gauteng 2014 South Africa, Lee Dingain, Olli Haukkovaara, Nick P. Williams, Nick International Raptor Ecologist Abu Dhabi, Darlene Luckins, Barbara Padgett, Sandra Paci, Gyorgy Szimuly, Juha Honkala, Rick Simpson – Wader Quest, Peter Sharland and Sue Oertli, David Taylor, Potters Bar and Barnet RSPB Local Group, Geri Thomas, Kathryn Stennett, Peter Sharland, Nick Green, HG Simpson, Collected at the North-West Birdwatching Fetsival at Mertin Mere WWT 23-24th November, South Beds RSPB local group meeting, Festival Brasileiro das Aves Migratorias, Instituto Pro-Pampa, Giliandro Silva, Suzi Paeva, Rafael Diaz, David Taylor, West Lancashire Wildlife on behalf of Jeremy Squire, Miranda Natrualists' Trust, Birds New Zealand (Manawatu branch), Waderquest SA, Peter Sharland, Dave Thrussell, Rick and Elis Simpson, talk in South Africa - Wader Quest, British Birdwatching Fair, Mike Hodgkins, Chris Lamsdell, Jane Binstead, Chris & John Hamilton, Robbin Knapp, Gyorgy Szimuly, Louisiana Ornithological Society, Judith O'Neale, Knut Hansen, Gyorgy Szimuly, Buckinghamshire Bird Club, Wendover talk , Ian Gray, Simon Fogg, David and Claire Simpson, David Bakewell, Ken Tucker, Phil Gunson, Sue & Owen Oertli, Waderquest from your South African fan club (Peter Sharland), Marc Hughes, David and Claire Simpson, Ian Simpson, Janice Nordenberg, Sue Smith, San Diego Field Ornithologists' meeting, Adrian & Pat Childs, Dave and Norma Park, Bill, Nancy and Robin, Graham Horrocks, saskia janes, Bruce Lombardo, Jeff Skrentny, Olli Haukkovaara, Gyorgy Szimuly, Christine Crickmore, Oliver Simms, Lee Dingain and RachelWalls, Ruth Miller, John Thatcher, Jeremy Minns, Pawasut Chatmaleerat, Martin Simpson, Arthur Grosset, Juha Honkala, Rick and Elis Simpson. Also a number of people donated anonymously. There were also many people we met along the way who made our travelling so pleasurable (or at times when it wasn't going so well, bearable). That's a very large number of people who have been involved in one way or another, and some in many ways. If we have missed your name off it is not because your contribution was not valued, it is a simple administrative error or typo, please don't get upset, get in touch instead and we'll add you to the list. This does not mean we are going away. 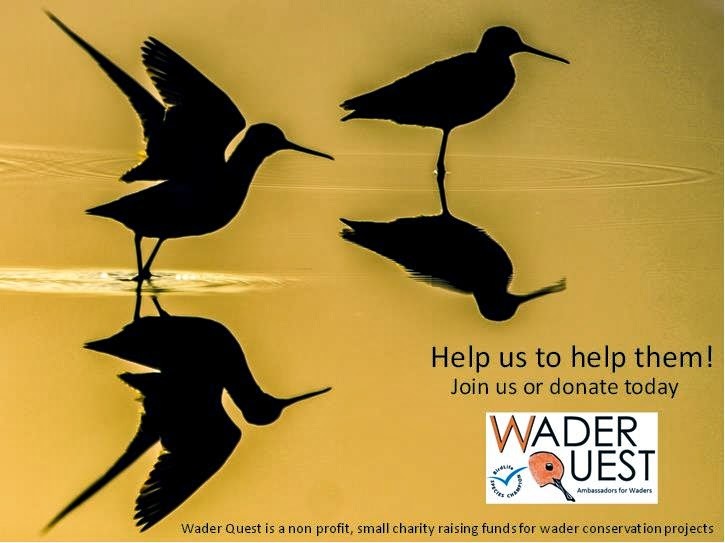 Wader Quest will now continue as a small charity raising funds for wader conservation projects across the world. If you like the sound of that why don't you join us as a Founder Sponsor, it is ridiculously cheap and you will be contributing to a tremendously good cause.